Namdaemun consistently is found on the itinerary of many tourists for its shopping and sights but what some don't know is that there are a few alleys scattered about the area dedicated just for eating. In addition to the famed braised fish alley, there's a kalguksu and bibimbap alley that's well known among Namdaemun frequenters. The kalguksu bibimbap alley actually began as a quick eating stop for the many vendors and shop owners in, and near, the market but word of the alley's ample portions yet cheap prices quickly spread, making it a popular joint that's now busy with both locals and visitors at any given time. 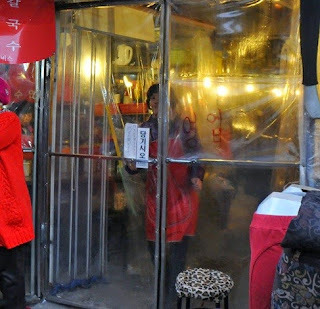 The alley is only a few meters long but the activity level inside is teeming; step inside and walk down the runway of sorts as ajummas immediately shout enticements at you in various languages to try and lure you to their stall. It's gruff, boisterous, lively, and a comparison to the feeding frenzy of a pack of piranhas is uncannily similar. As competitive and aggressive as the ajummas are in bringing business to their respective stalls, they're actually all very good friends who share food, ingredients, and laughter in their down times. Whichever stall you choose, the menu options are all the same: bibimbap, kalguksu, bibim naengmyeon, mool naengmyeon, jjolmyeon, etc. Standard boonshik (quick eats) fare. When you've selected a shop, have a seat (most likely you'll be seated elbow-to-elbow with a stranger) and make your order. As the sign picture above shows, I usually frequent the "Seoul Sikdang" stall. The biggest deal that the area is known for is its bori bap (barley rice) and chal bap (glutinous rice) deal which, on their own isn't exactly the most exciting thing to eat except for the fact that their ordering results in some bibimbap, bibim naengmyeon, and kalguksu thrown in as freebies. It's a killer deal if you're with a plus one for an array of food and only for a measly 11,500 won for the both of you. The various banchans are made fresh each morning and resupplied as needed throughout the day and the soup and knife cut noodles are also made in-house. The barley rice is essentially bibimbap as the barley rice comes topped with a little bit of all the sides (soybean sprouts, young radish leaves kimchi, lettuce, chives, seasoned radish) and some seasoning paste for mixing. Provided on the side is a hearty dwenjang based soup. The soup stock is seafood based. The soup can change though, depending on the season and what's in-season. The chalbap (glutinous rice) is like the barley rice but the glutinous rice is separate and its serving bowl is absolutely enormous. I'm not sure if the lady just went wild with the rice portion because we were guys but I was stuffed from the rice, sides, noodles, soup, and everything well until dinner time. Interestingly, for the glutinous rice, the ajumma gives you a bowl of shredded, seasoned, toasted seaweed crumbles. As per her instructions, take a bit of the rice, dip it in the seaweed crumbles and eat the sides like a salad. The basic banchan is two kinds of kimchi- one regular napa cabbage one and one made from yeolmu (young radish). Before you're finished with your meal, then comes the little bit of bibim naengmyeon for the both of you. It's essentially noodles, a bit of cucumber, the spicy sweet seasoning and a sliced egg and toasted sesame seeds. Certainly just a taste's worth in size and nothing extraordinary as the seasoning tastes very bunshik-like but darned if it's not still tasty. And even before you finish THAT, then comes the kalguksu (knife cut noodles). This one's a bit fancier than the bibim naengmyeon with noodles, broth, chives, toasted seaweed crumbles, some yubu strips (fried tofu pouch strips), and a bit of seasoning paste. If you're not keen on the spicy flavors, ask for the seasoning paste to be left out- "다대기 빼주세요" or "Da-dae-gi bbae-joo-seh-yo." (Please leave out the seasoning paste). Give it all a mix and you are ready to dig in. Again, we're talking bunshik style food so the quality isn't as fancy as a regular kalguksu joint. But it's still tasty and good in chilly weather (albeit just a tad salty for my taste). It's unfortunate that prices for eating out in Korea have been rising in recent years but the kalguksu and bibimbap alley still makes for an inexpensive eat and a way to get in a variety of food in a fun setting. If you haven't tried it yet, it's worth trying and I definitely recommend it for visitors to Seoul- especially if they are already heading to the Namdaemun area! It's not high-brow fare but it's cheap, fast, and filling and an experience worth having if you haven't tried before. Everything is made fresh daily and the experience of eating in the historic Namdaemun market with locals is one you definitely should try at least once! 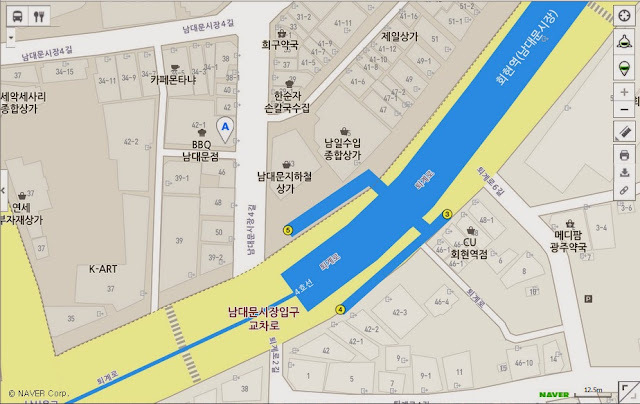 Immediately after coming out of Hoehyun Station, exit 5, turn right into the major alley and walk about 30 meters. On the left you'll see an entrance to the kalguksu alley with the alley entrance covered by a tarp door. I'm not 100% certain but I believe most stalls accept cash only! Is it @ Hoehyeon Station ? Yes! You're absolutely right! I was in zombie mode all of last week after returning from HK. Thanks for pointing that out, Si Ying! Hi, what time does the Kalguksu Alley close?